The containers are unloaded and providing clothing, food and hygiene supplies for the people recovering from Tropical Storm Noel. God has the best timing...If the containers were unloaded before the storm, many items would be ruined. 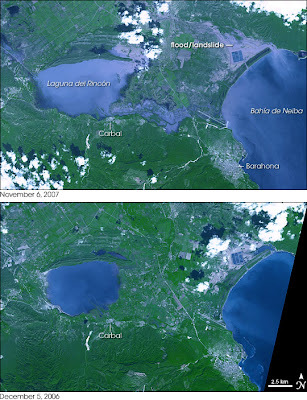 These satelite photos show the flooding, and much of the area has standing water, attracting mosquitos. Please pray for the team arriving on Saturday to serve the families who have lost their homes and possessions in our bateys.